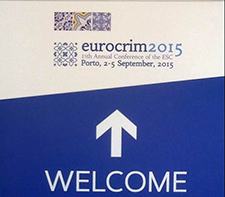 Dr. Clairissa Breen, program director of Criminal Justice and Homeland Security Studies, attended the European Congress of Criminology September 2-5, 2015, held in Porto, Portugal. The annual conference is hosted by the European Society of Criminology. Breen was invited to the conference last year and presented on the topic "Catastrophic Criminology." Her presentation was well received and landed her a second invitation for this year’s conference. The conference includes research in the field of criminology including: terrorism, policing, victims, offenders, courts, laws, policies and regulations, organized crime, cyber security, among others. This year, Breen presented on the topic "Catastrophic Victimology," which is the study of victims of catastrophic criminological events such as terrorism, genocide, mass, serial or spree killing, or the criminal responses to natural or manmade disasters. In her presentation, she explained how victims of a catastrophic event and where the event occurred often become more important than the offender. "The location of where the event occurred becomes important because many people associate the location with the event long after it has ended." Aside from presenting her own research, Dr. Breen attended many other presentations throughout the conference. “I attended some fascinating presentations that provided an international perspective on information I cover in classes which I plan to incorporate. I will also include new ideas on the experiences of the elderly as victims of crime, and new information on organized crime that may result in new topics within existing courses, or possibly a new course next year,” said Breen. 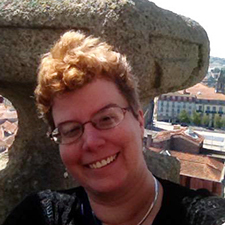 Breen tweeted throughout the conference with #EuroCrim15, sharing her own thoughts about presentations, topics she wanted her students to research, and posted a selfie from the top of Clerigos Tower. Dr. Breen will be attending the Security Solutions International Counter Terrorism Conference in November this year to give a presentation on "self-radicalization, new trends and tactics in domestic terrorism threats." To learn more about Dr. Breen, view her faculty profile and follow her on Twitter at @ClairissaDrCrim.